User defined date field can play an important part of your schedule reporting and driving your project team. It can be used as early indicator of your project status in order to mitigate potential delay and highlight as early as possible. Suppose you have a project with a fix project completion date that has been agreed with your client. Your team must be working on the particular dates (internal baseline) that have been agreed within your team which is ahead of your client’s completion date. Your planned dates are earlier as to provide additional floats that can be used to mitigate the residual risks without affecting contract completion date. So you may want to populate user defined dates which are the Target Dates for each task that you have planned based on the client completion date. Once the agreed based line project is developed within your team, populate the user defined dates on each task or some tasks as agreed with project manager. Once the project is progressed, current project performance can be monitored using user defined date by means of schedule bar chart reporting that would bring attention to your project team. Go to Enterprise > User Defined Fields > Select Activities from drop down box > Define the Target Start on the user_start date and Target Finish on user_end_date. Once user defined field dates have been created, go to Project > Activities, populate the dates on the Target Start and Target Finish column that you have created in User Defined Fields. 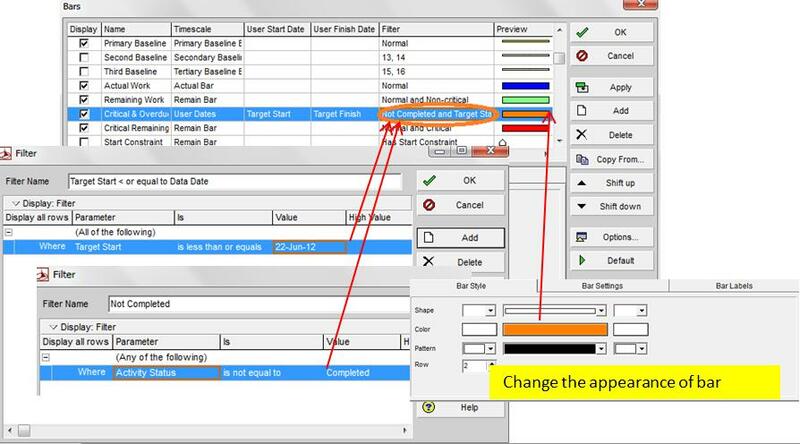 Once the dates have been populated, create the user defined bar, right click in the Gantt Chart area and select bar or go to View > Bar from menu bar. Add the new bar and name as Overdue or as desired, select the User Dates under Time scale column. Select the Target Start and Target Finish that you have created in User Defined Field under User Start Date and Finish Date Column respectively. Create the user defined filter for the activities that we want to show graphically in the schedule bar. Note: This filter is not meant for the layout but only meant for the user defined bar. Click the filter column of new bar you just added. Select the filter criteria, Target Start is less than or equal to data date. Note: here, we select custom date as a data date (22 Jun 12 for instance) instead of P6 default date called “DD”. Bar filter doesn’t work if you chose “DD” as we have used User Defined Fields. Select the additional filter: Activity status is not equal to completed. The final step is to change appearance of the bar as you desired. See below.